For over 30 years, the Property Tax Appeal Group ("P-TAG") and its principals have appealed the real estate (ad valorem) property tax assessment for many properties located in Broward County. 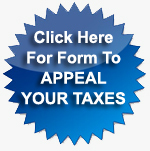 Because Broward County recently mailed out their proposed tax rates (called a "Truth In Millage Notice" or TRIM Notice) to all property owners, any owner of real estate property located in Broward County now has until September 19, 2011 to file petitions to appeal their real estate property tax assessment. For over 30 years, the Property Tax Appeal Group ("P-TAG") and its principals have appealed the real estate (ad valorem) property tax assessment for many properties located in Miami Dade County. Because Miami Dade County recently mailed out their proposed tax rates (called a "Truth In Millage Notice" or TRIM Notice) to all property owners, any owner of real estate property located in Miami Dade County now has until September 19, 2011 to file petitions to appeal their real estate property tax assessment. as existing sales in the metropolitan region rose at a rapid pace in July, according to the Miami Association of Realtors. The spike in average home prices may signal a major turn around for the market, which has been one of the hardest hit in the U.S. The average sales price for homes in Miami-Dade County increased 9.3% in July from a year ago, and condos soared an average of 17.9% during the month as foreign buyers took advantage of discount priced foreclosures and near record low mortgage rates. Sales of existing homes rose 47% in July and condominiums increased 33% in what may be developing as one of the first major transitions from the real estate crash to a home price recovery. The Miami market has idled from a housing downturn that led the nation in deflation for more than three years, but the increase in home and condo prices may show the first signs of a major home price recovery with higher prices in July. The Florida housing market has a long way to go to recover from its downturn, but Miami could lead the turn around. Statewide sales rose 12% in July, but home prices are still declining in most of the state. Miami may lead the state’s recovery. More than half or 59% of transactions were paid in cash during the month. Condominium developments are still idled in Miami Beach, fenced off and awaiting a rebirth as a result of lenders pulling financing during the crash, but are slowly receiving new financing programs after developers settle with banks in court and often times hedge funds that once backed the financing on their projects. The effect of short sales and foreclosures on home prices has dropped in some areas of the greater Miami region. In June, 57% of all closed residential sales in Miami-Dade County were distressed, including foreclosures and short sales compared to 65% a year earlier.